I have a friend who is one of the best self-promoters I've ever seen, and good luck to her. I wish I had half her guts. I can't tell you who she is because she won't thank me for writing about this subject, but you could probably guess if you've been following my blogs for the last couple of years. This friend is a lovely, intelligent and very accomplished woman, both within and without the writing world. And she is also a gifted marketer! Unfortunately, I am not! I really struggle in the self-promotion stakes and always have done, and after asking around, it seems I'm not alone. Apparently, being able to talk about your talents and successes is one of the most difficult things any of us will ever contemplate. Perhaps that is why many people are scared of attending job interviews. As a professional writer, I'm confident enough to talk openly and freely about the art of writing. When I'm not writing novels, I work as a contract technical writer and whenever I meet prospective employers I'm always very relaxed and ready to talk about my work. I mean, what other chance do you ever get to talk about your successes to someone who genuinely wants to know? Additionally, I'm very happy to chat about my novels, my plots, characters and the writing process in general - yep I love it! But when it comes to marketing my books, selling them ... for money ... oh dear, that's when it all falls apart and I become all tongue-tied and next to useless. When I try to understand the reason why this might be, I think it's because when I'm promoting my books, what I'm really saying is, "Hey, here's this great book I've written. Why don't you hand over some of that hard-earned cash you may, or may not have, and buy a copy?" And that is exactly where I feel uncomfortable. Expecting people to open their wallets is a big ask these days, and I feel rather rude promoting my books with that end in mind. So, back to my author friend. To watch her in action is a thing of beauty. She sells her books with confidence, ease and a smile; she is just really, really good at it. One day, over a cuppa, I asked her how she manages to be so relaxed with her promotions and marketing. Her answer shocked me. She said, "I'm not relaxed at all. I'm terrified the entire time." When I expressed my surprise, she told me that she forces herself to step into different shoes, almost like she's playing the role of someone really confident in a movie. "It's not me," she said. "It's someone else, someone who is completely shameless. I couldn't do it otherwise." You'd think that I'd be glad that I wasn't alone in my fear of self-promotion, wouldn't you? But not so. I had looked to my friend for the answers. I was expecting some panacea that would instantly transform me into a glowing, confident marketer. What did I find instead? I found someone just like me. Ask around and it's a common theme. At a writers' event some time back, I asked fellow writers how they felt about self-promotion and almost every one of them said they were hopeless at it and afraid of it. Their reasons were varied. Some said they were too shy to talk to people. Others felt uncomfortable asking people to pay money for their books. A few more said they didn't feel good enough to call themselves writers and that people reading their books would discover the frauds they really are! Oh yeah - I can relate to all that! So where does that leave us? Way outside of our comfort zones, that's where! And when I think about my friend and how successful she is, and now that I know how afraid of the self-promotion thing she is, I realise that there's no other way. You must be brave and get out there. We writers - insular and solitary creatures that we are - will simply have to stiffen our spines and take that step out into the world. 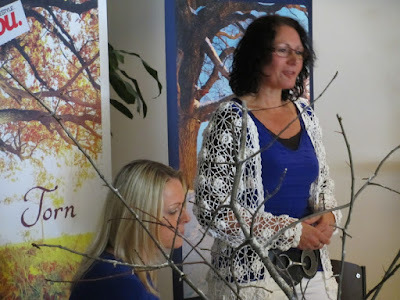 At a recent book signing event in a very small town in NSW, I had the opportunity to meet so many very friendly locals, who, perhaps because of their location, don't often get the chance to meet writers from the big cities. They were so happy to see me, talk about my books and even buy copies, that I came away from the event thinking, Hey I can do this! These people actually wanted to read my book! What a revelation! I've been doing book events for years but every time is like the first time. It feels like you're never going to get used to it. Maybe that keeps it fresh and that has to be a good thing, doesn't it? No body really likes an overconfident braggart! Until next week ... be safe, be happy and read a good book! Here I am making a speech at the Inviolate launch. I'm alright once I get warmed up!